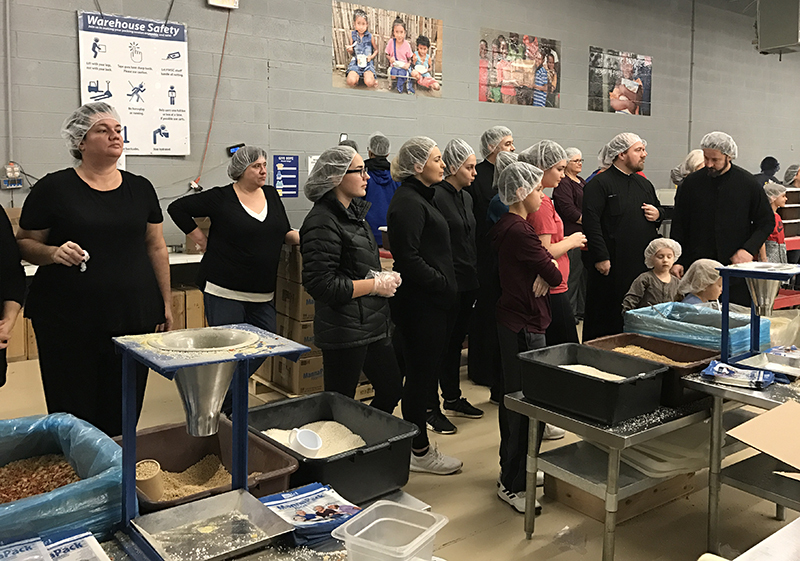 On Friday, November 23, 2018, the Teen Youth Group of Holy Resurrection Cathedral in Chicago, Illinois, volunteered at “Feed My Starving Children”, a Christian non-profit organization that helps feed starving and malnourished children all over the world. The youth were able to put their Orthodox Christian faith in action to help pack simple meals that children eagerly look forward to receive just to stay alive. The parents, family members and the Cathedral Clergy, Fr. Darko Spasojevic, Fr. Dobrivoje Milunovic, and Fr. Nikolaj Kostur, also joined the youth group to offer support and to help in the efforts to pack meals. The Teen Youth Group of the Serbian Cathedral in Chicago is led by Protinica Jelena Milunovic. One of every nine children in the world go to bed hungry. These statistics have a worse ratio in countries like Africa. To a starving child, hope can only begin with a reliable source of nutritious food. Some 795 million people in the world do not have enough food to lead a healthy active life. On the doorstep of Advent and in the spirit of almsgiving, the youth were happy to see how their volunteering had a direct impact on helping feed hungry children. Through our efforts, we were able to pack 44,064 meal packets (204 boxes) that will help feed 120 children for ONE year in Africa. The youth understand that we have so many of God’s blessings to be thankful for, and that we should always try to help those in need.